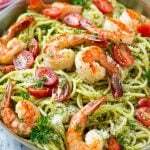 This recipe for shrimp pesto pasta is spaghetti tossed in a flavorful pesto sauce, then topped with sauteed shrimp and tomatoes. A fresh and easy dinner that’s quick to make and packed with flavor! If you’ve been reading her for a while, you know I’m ALL about the easy dinner ideas. 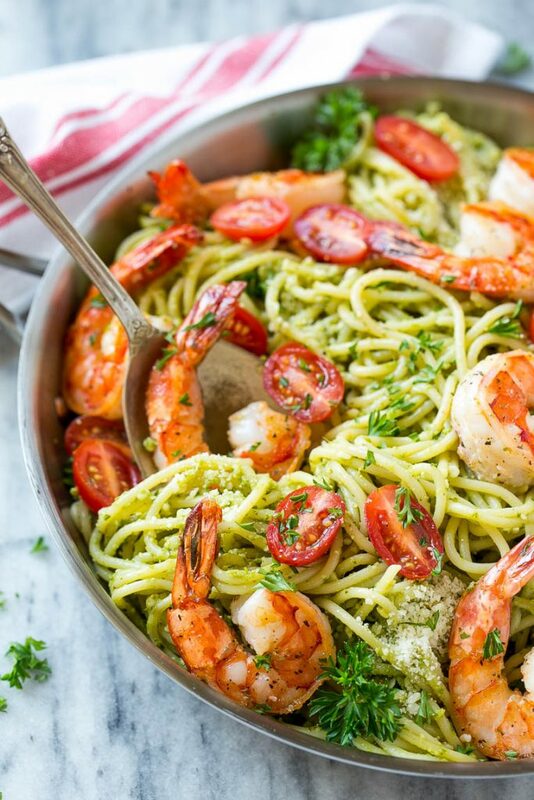 It doesn’t get much simpler than this shrimp pesto pasta! The whole thing is ready in about 20 minutes, you can’t beat that! 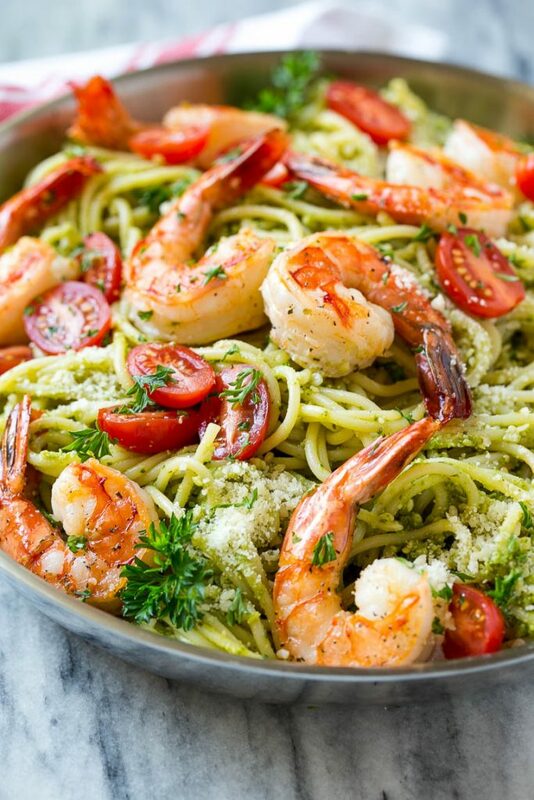 I like to use spaghetti for my shrimp pesto pasta, but linguine or fettuccine would also be great. While the pasta is boiling, I cook up my shrimp. 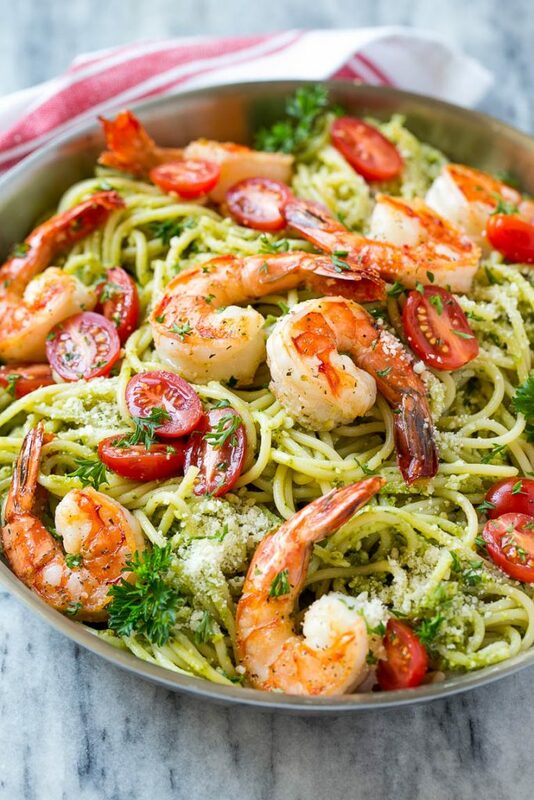 After the noodles are done, I simply toss the pasta with the shrimp, pesto, add some tomatoes and cheese, and dinner is served! So here’s my little secret: I don’t make my own pesto. Yes, you can make your own pesto, but there are so many high quality store bought versions these days that I feel like it’s not always worth the extra time and effort. My favorite pesto is the Kirkland brand at Costco, it comes in a jar in the refrigerated section. The refrigerated store bought pesto tends to be superior in flavor to the shelf stable type, so go for the fresh stuff whenever possible! This pesto pasta recipe gets finished off with a sprinkling of parmesan cheese, fresh tomatoes and herbs. I went with parsley because that’s what I had on hand, but you could also use basil or even just skip the herbs if you don’t happen to have them on hand. Another awesome addition to this dish would be pine nuts, or even some sauteed zucchini! 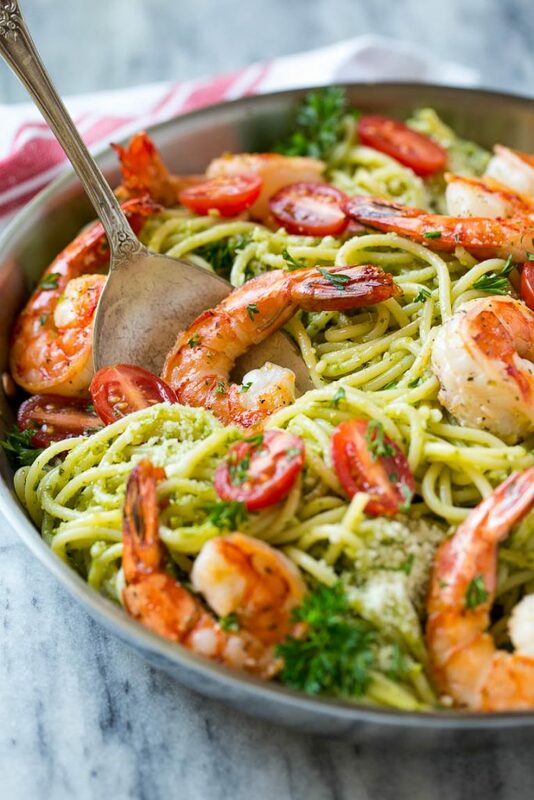 I’m definitely going to be turning to this shrimp pesto pasta when I need a speedy dinner. If you add a loaf of bread and a green salad, it’s even fancy enough for company! 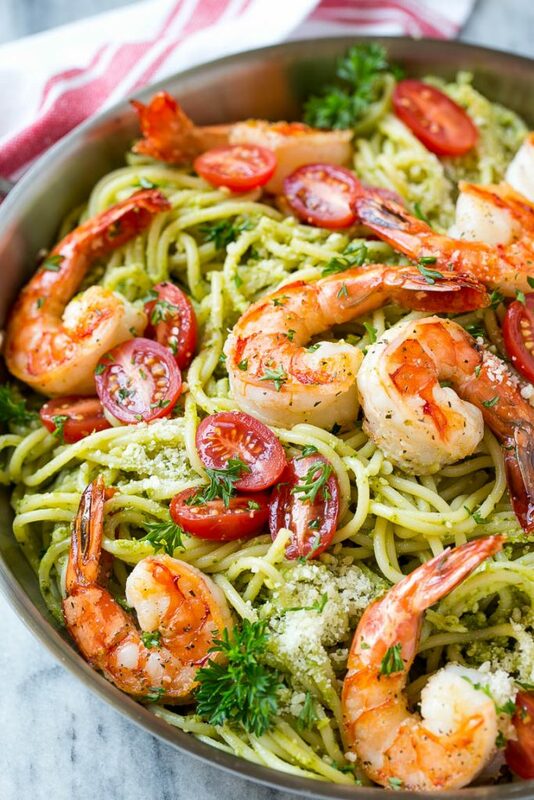 This recipe for shrimp pesto pasta is spaghetti tossed in a flavorful pesto sauce, then topped with sauteed shrimp and tomatoes. A fresh and easy dinner that's quick to make and packed with flavor! Heat the olive oil in a large pan over high heat. Add the shrimp and sprinkle with Italian seasoning, salt and pepper. Cook for 2-4 minutes or until shrimp are just pink and opaque. Turn off the heat. Add the cherry tomatoes and parmesan cheese to the pan. Garnish with chopped parsley if desired. I will make this for dinner tonight for my husband and I. The kids are not fans of shrimp, so before I add the shrimp I will take a portion out and mix it with grilled chicken for them. One dinner will please the whole family! Thank you! Great idea, hope you enjoy! Delish!!! Wow simple yet super tasty! I am growing basil in my basement and what better way than to use it than trying your recipe! I am so glad I found your post! OMG this looks so so good. The shrimp literally had me wanting to devour my laptop screen. I love how deliciously easy it looks to make because that means even little ol me can make it. Great job! This is my second time making this dish. My family loves it. I didn’t change a thing. Delicious. er. what the hell happened to the recipe? The photos are nice, and the video is fine, but nowhere do I see measurements for any of the ingredients! perhaps it’s a glitch, because I see recipes for some of the other dishes on this site — just not this one. Also, for some reason, i can’t type capital letters in the comments. weird. Could ham work instead of the prawns do you think? Sure, chicken would be great too! Made this recipe for Christmas and we loved! I can’t wait to make again. Simplistic and delicious! Would the prawn pesto and pasta be served cold or warm or either. I always serve it warm!